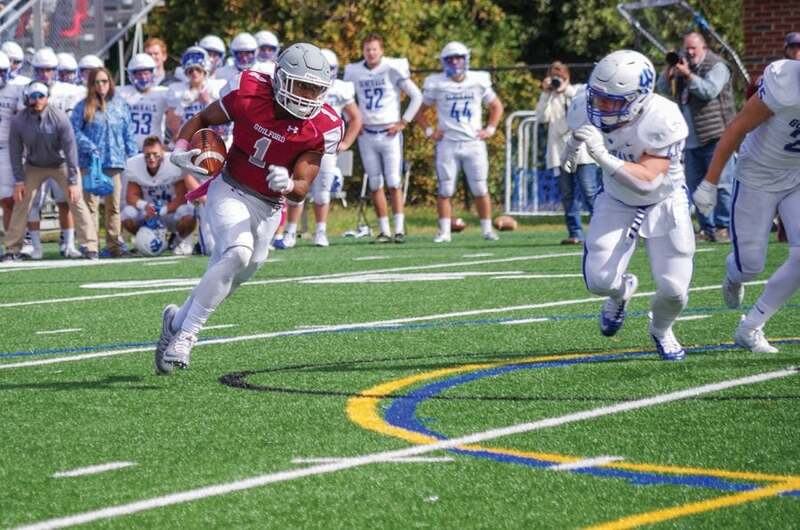 The Guilford College football team came away with a Senior Day upset victory over Washington and Lee University (5-2, 3-2 Old Dominion Athletic Conference) on Oct. 27. The defense held the Generals to only a field goal and the offense poured in 40 points. It was a complete shift from last season, where Guilford lost 47-26 and allowed 558 yards of total offense. This time, Guilford held Washington and Lee to 183 yards of total offense and did not allow a touchdown. The Generals did not score until 6:40 left in the game when sophomore place kicker Jarrett Wright made a 28-yard field goal. The Guilford offense started with Bell scoring from one-yard out. Bell then got a 42-yard score to end the first quarter with a 14-0 lead. The offense kept on putting up points while the defense stifled the Generals’ offense. “We held the ball, we took it away from their offense, we put drives together and that’s really how you beat that team,” said sophomore quarterback Alex Manley. The Guilford defense had struggled in the past when facing a triple-option offense. They allowed 91 points to Davidson College earlier this year and allowed 47 points to Washington and Lee last year. This game, the Quakers had some in the right position every play, forcing five turnovers as well as stopping the Generals from converting on fourth down three times. “Confidence and playing assignment football, that’s all you got to do against a team like that and they learned a lot from the Davidson game and they came back and performed at a high level,” said Rusiewicz. Redshirt sophomore linebacker Bryce Smith led the team with 14 tackles, a forced fumble and a fumble recovery. Sophomore linebacker Gerard Seals had two of the teams nine tackles for a loss as well as 10 tackles and a forced fumble. The Generals’ offense could not get its running game going and at the same time its passing game could not complete a pass. Junior quarterback Drew Richardson completed one of nine passes for twenty yards and sophomore quarterback Trey Laughlin was off target on both his passes. Guilford junior defensive back Jeremiah Hedrick intercepted one of Laughlin’s two passes. “We’ve seen the triple option before and they put a whooping on us, so this was kind of like our second opportunity, our redemption period against this type of and I feel like we showed up to it,” said Hedrick. In the third quarter, the Generals offense had two turnover on downs, one interception, and two fumbles. Multiples times in the second half Washington and Lee had the ball in the redzone but a field goal was the only thing to come out of the opportunities. “I feel like once we started getting the ball rolling and the energy going, they couldn’t stop us,” said Hedrick. Washington and Lee ended the game with the ball at the Quakers nine-yard line, deciding to not go for it on fourth down and letting the clock run out. Before this game, the least amount of point allowed by the Guilford defense was 27 against Ferrum College on Oct. 12. Manley found sophomore wide receiver Jordan Smith with a 61-yard pass for his lone passing touchdown of the game. Manley went 23-34 and had 265 passing yards. This was the first time since playing Davidson on Sept. 13 that Manley did not throw at least one interception in a game. Bell has 17 rushing touchdowns on the season, ranked fourth in the NCAA Division III and he broke the college record of 13 earlier this season. Ball also has 1049 rushing yards this season, a career-high. Bell is averaging 231.3 all-purpose yards a game, which is ranked second in Division III. The Guilford offense ranks 10th in Division III with averaging 508.6 yards per game. The Quakers’ record is 3-4 overall, and 2-3 in conference play with two games remaining on the schedule. The next game for Guilford is Nov. 3 at Shenandoah University (3-5, 1-4 ODAC). Shenandoah averages 496.4 yards of offense per game but its defense allows only three yards less than that a game.